Edradour Distillery was founded in 1825 as cooperative. After almost 200 years, considering it’s distilling capacity of little over 100 000 liters a year, it can still be called farm distillery. For a long time Edradour malt played crucial role in formulas of premium blends, such as King’s Ransom and House of Lords. 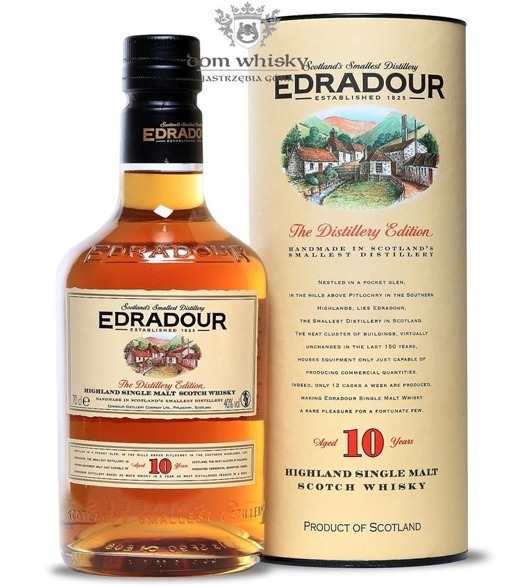 Edradour 10 years old debuted in 1986, when the distillery was part of Pernod Ricard, and still remains the core expression. Since 2002 Edradour Distillery has been owned by one of the leading Independent Bottlers, Signatory Vintage Scotch Whisky Co. Ltd. Nose: smooth, dried apricots and prunes, almonds, honey, notes of Oloroso sherry and delicate traces of peat smoke. Palate: rich and nicely balanced, mixed nuts and almonds, dried fruit, caramel, vanilla custard, hints of spice. Finish: medium long, slightly nutty, with sherry and spicy notes.